ADHD can make everyday and special tasks seem overwhelming. 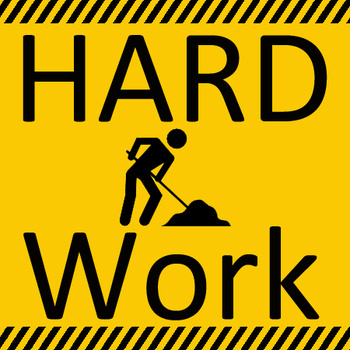 Sometimes, life seems overrun with hard work! I try to keep this quotation in mind when I am struggling – especially when everyone around me seems to be able to accomplish twice as much in half the time. The payoff makes hard work worthwhile. Since I find typing tedious, and soon lose interest, I decided to try Dragon Anywhere to dictate my writing. I still have to go back and edit – but I can already see that dictation software could be a blessing for anyone with ADHD. The following is a sample scene from the book I’m working on. I haven’t edited much . . . .WAY too much passive tense – but, not surprisingly, I digress. Stella hated her parents house. It was all white. The walls. The couch. The carpeting. The people. Stella’s mother had seen this in some architectural digest. Supposedly, the latest thing with the rich and famous. Not that Stella’s parents were rich or famous. Rich maybe. Stella didn’t get to see much of that. Each night, her parents went out to one party or another. Maybe the opera. Maybe a dinner. Maybe a fundraiser -not that they ever donated money. Stella spent much of her time trying to figure out how to get out of that White House. The idea to slip out first came to her while watching a movie late one night. The woman in the movie lived a double life. During the day – a normal housewife with three beautiful children and husband who adored her. At night, she was a prostitute on the streets of Paris. Stella wanted to be that actress. She wanted to be that woman. As long as she could remember, Stella had wanted to be an actress. She spent hours in a room pretending to be one person to another. Sometimes a princess who had everything-sometimes the popper with nothing he lived on her wits. The third night the Astrophel family lived in Colorado, Stella decided to slip out. Just like that actress. Just like that woman. Enjoying the irony, Stella dressed in all black. A leather miniskirt, a low-cut crop top, and, of course, a black leather jacket. She hid the thigh-high black leather boots from her parents. By day, they sat hidden in the back of her closet, behind the designer flats, pumps, and the Jimmy Choo sandals. At night, she slipped on the boots, zipping them up to the top of her thighs, pretending to be the Julia Roberts in “Pretty Woman”. No. That wasn’t right. She was a much better actress than Julia Roberts. At 15, she could be any age she wanted to be. Any age she needed to be. When she applied the dark lipstick, the layers of mascara, the oversized hoop earrings – she became someone other than Stella. Someone other than the good girl. That girl who always got A’s in school. The one inspected each morning by her father to make sure she was impeccably dressed before leaving for school each day. Gone were the designer dresses, the Manolo Blahnik mules, the emerald ring her mother brought her from Paris. At night, Stella was trash. And that’s the way she wanted it. Kind of lame – needs work – but it only took me 10 minutes instead of 2 hours to write. Dragon Anywhere is a product of Nuance Communications, Inc. It can be downloaded as an app for IOS or Android operating systems. There is a one week free trial – after that it is $15/month or $150 annually. For me, the price is worth it, but it IS a consideration.I loaded it on my iPhone and iPad (no – I’m not shilling for Apple!). I’ve tried it on the tablet – but have yet to experiment with the phone version. If you out Dragon Anywhere – I’d love to know what you think. you can comment here – or email me at heather@writingasigo.com.